Making it lighter weight, weather resistant, and rust proof. Even the top surface is solid 1/8 inch thick aluminum, which is much stronger than foam cored aluminum panels (aluminum composite). There are no fasteners, everything is professionally welded. This thing is built strong! It has no oil can effect (surface will not ‘give’ or feel spongy) when weight is applied. 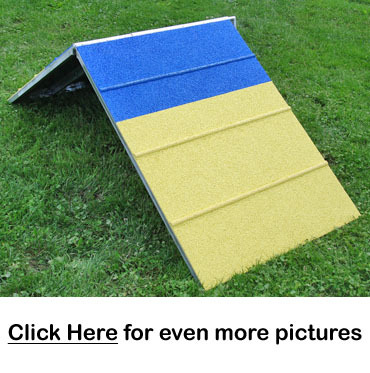 The ramp dimensions are 46” tall by 33-1/2" wide. Specially designed apex has no gaps and is safe for your dog's feet. The preferred contact obstacle surface for comfort, speed, safety, and traction. This is a professionally applied, minimal thickness (to reduce weight), balance blended rubber surface that will last a decade. Skin is made from TPV rubber granules from American Recycling, the best quality virgin polymer. It has a dust free, uniform granule size, that is UV resistant. The binder has been specially developed by Dow Chemical. Hose it off, power wash it, leave it outside in the elements… it can handle it! Plus, it looks beautifully amazing. No sloppy job here… it has no bleed through of glue, a consistent thickness of rubber, and a blend of rubber and binder throughout that makes for a much more comfortable surface for your dogs paws, without ever shedding. It is able to handle the rigorous activity of kennels, shelters, training centers, etc. It is royal blue with 30” yellow contact zones. The rubber grip strips have minimal thickness for the safety of your dog. Set up and take down is easy! To take it apart, simply tip it on it’s side and pull out the hinge pin at the top. When set up, it is fully adjustable to even the lowest heights with heavy duty chain and easy clasps. Ready to ship... by UPS! It has been specially designed to ship via regular UPS instead of a freight truck. Great for small yards, indoor use, training beginner dogs, doggie daycares, training centers, and more! "Just wanted to let you know my mini A-Frame arrived today in great shape. Love it... man, that thing is built solid! But, this 120lb woman in her 60's had no problem setting it up. I sort of cringed splurging that much money on dog agility equipment; but I have to say this is a quality piece that looks like it will last for many years... well worth the price. The hinge design at the apex is great. No chance of the dog getting a toenail caught. The dogs feel very secure on it. The coating is attractive and gives them very good footing. Thank You! Dianne"
Optional: Transform Your Mini A-Frame! Expand the capabilities of your Mini A-Frame, and turn it into the "crossover" arrangement. Click here to learn more.